Sunflowers have always been my favorite flower. I find their large, cheerful, yellow petals totally irresistible. Passing by a bouquet or a field filled with sunflowers is cause to make my head turn. 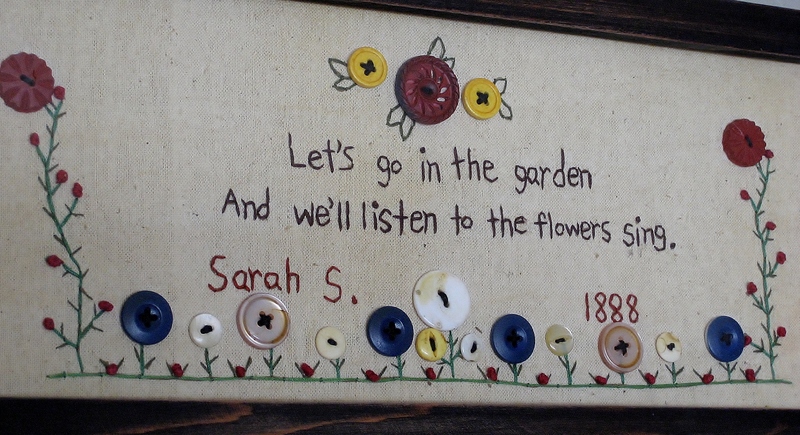 While visiting a local farmer’s market one day I walked past a farm stand with bouquets of plate sized flowers. I was so tempted to buy my very own fist full of yellow sunshine. If you have ever held such a bouquet then you know how heavy and sticky if can be. Rather than negotiate their transportation right then I decided to postpone the purchase until later. Before heading for home I returned to that booth and made my purchase. After carefully transporting the flowers home I released the flowers from the binding that held them together and examined each flower. By the time we had reached home the petals on my five gorgeous specimens had begun to droop, ever so slightly. To quench their need for refreshment I made a fresh-cut on each stem, then submerged their thirsty feet into water. In no time the vibrant petals were once again perky and ready for enjoyment. For days on end my home was brightened by the presence of my little piece of sunshine. I felt so lucky to have had the opportunity to have my very own bouquet of bright and shiny sunflowers. 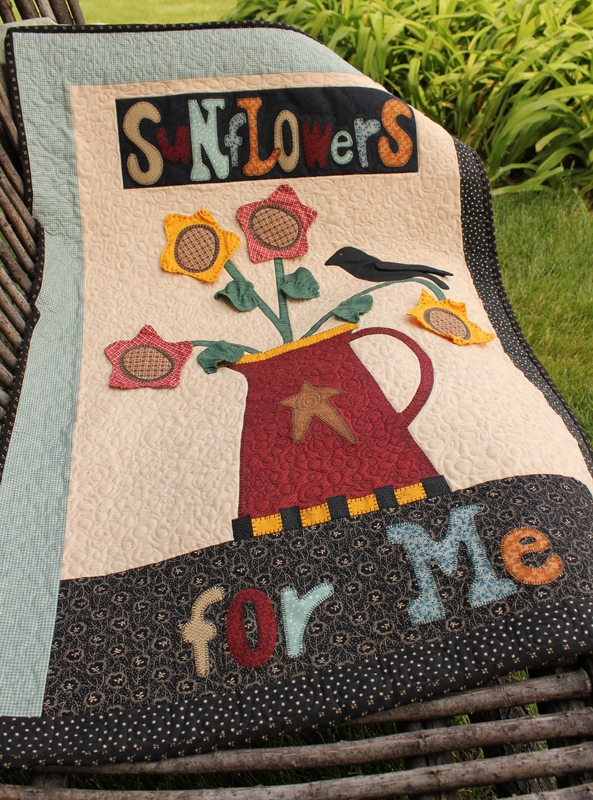 As you can see from my photos I’ve managed to incorporate sunflowers in more than one of my quilts. 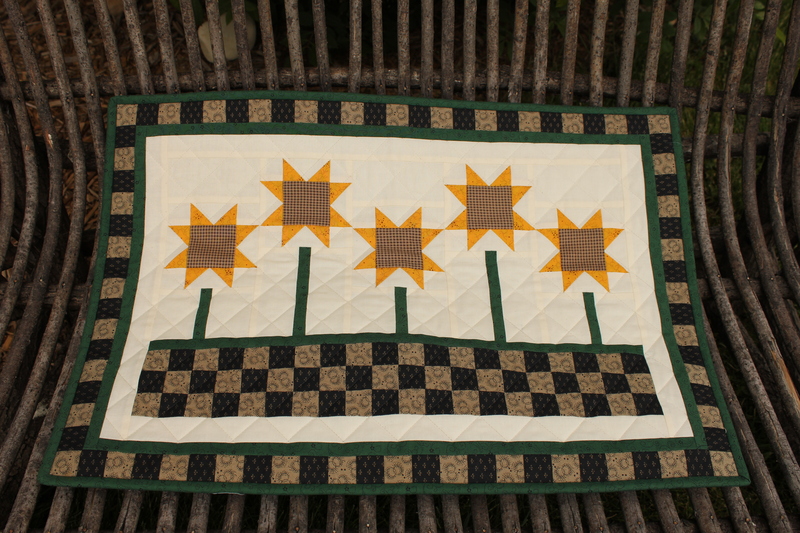 The top right wall hanging was constructed from a pattern designed by Country Lore Designs. If you follow the included link you will see that it is still available as Item # 36. This is one of my favorite mini quilts. It totally reflects my craving for sunflowers. The photo in the bottom right corner is of a project I worked on with my mother many years ago. Each of us made our own version. The original intention for the mini quilt was a set of placemats. I fell so in love with the finished product that I decided to stop with just one and use it as a wall hanging rather than hide it under a plate. Unfortunately the author of the pattern and where it was purchased is long since forgotten. 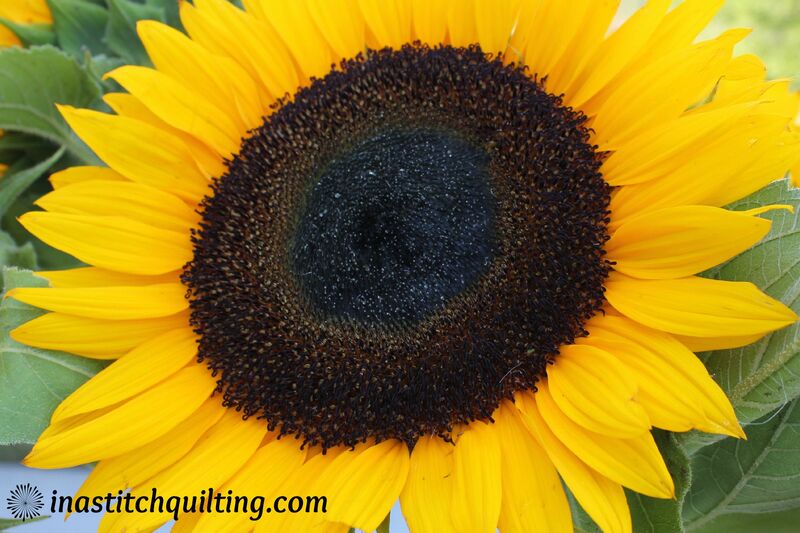 I hope by sharing my love for sunflowers it has helped to brighten your day. I know they add joy to mine. Who knows when I will stumble upon my next sunflower experience! Beautiful loving work! I like sunflowers too, I am a child of the sun.